Not to be confused with History of feminism. 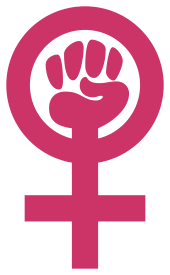 Feminist history refers to the re-reading of history from a female perspective. It is not the same as the history of feminism, which outlines the origins and evolution of the feminist movement. It also differs from women's history, which focuses on the role of women in historical events. The goal of feminist history is to explore and illuminate the female viewpoint of history through rediscovery of female writers, artists, philosophers, etc., in order to recover and demonstrate the significance of women's voices and choices in the past. Two particular problems which feminist history attempts to address are the exclusion of women from the historical and philosophical tradition, and the negative characterization of women or the feminine therein; however, feminist history is not solely concerned with issues of gender per se, but rather with the reinterpretation of history in a more holistic and balanced manner. The "disappearing woman" has been a focus of attention of academic feminist scholarship. Research into women's history and literature reveals a rich heritage of neglected culture. Feminist history combines the search for past female scholars with a modern feminist perspective on how history is affected by them. While many mistake it as women’s history, feminist history does not solely focus on the retelling of history from a woman’s perspective. Rather, it is interpreting history with a feminist frame of mind. It is also not to be confused with the history of feminism, which recounts the history of the feminist movements. Feminist historians, instead, include “cultural and social investigations” in the job description. Feminist history came into being as women began writing accounts of their own and other women’s lives. A few of these, such as Susan B. Anthony, documented histories of their feminist movement. Afterword, a fever drove women onward to be historically minded and create women’s archives. Feminist historians collect to analyze and analyze to connect. Rather than just recording women’s history, they allow a connection to be made with “public history." However, problems remain in integrating this improved history into a curriculum appropriate for students. Finally, feminist historians must now be able to understand the digital humanities involved in creating an online database of their primary sources as well as published works done by notable feminist historians. Feminist digital humanists work with feminist historians to reveal an online integration of the two histories. Harvard’s Women’s Studies Database contain sources, like the Gerritsen Collection, that allow scholarly papers by feminists to be written and publicly convey the fact that there is more than one history and the progress made in combining them. Feminist historians use women’s history to explore the different voices of past women. This gathering of information requires the help of experts who have dedicated their lives to this pursuit. It provides historians with primary sources that are vital to the integration of histories. Firsthand accounts, like Fiedler’s And the Walls Come Tumbling Down? (A Feminist View from East Berlin) recounts the daily lives of past women. It documents how their lives were affected by the laws of their government. Women’s historians go on to interpret how the laws changed these women’s lives, but feminist historians rely on this information to observe the ‘disappearing woman’. Fieldler even mentioned that “[t]hese feminists were disappointed when they meant ordinary eastern women who were good housewives too, while enjoying outside work." Because these feminists only knew the public history of the GDR, they projected themselves into the imaginary. Upon investigation of eastern women’s lives, they found that though the GDR’s socialist policies encouraged women in the labor force, there had been no women creating these policies. Once again, the patriarch had created a public history in which women were cut out. The discovery of neglected cultural accounts, similar to Fiedler’s, has allowed women’s historians to create large databases, available to feminist historians, out of them. These sources are analyzed by the historians to compare them to scholarly works published during the same time period. Finding works that are within the same time period isn’t too difficult, but the challenge is in knowing how to combine what they learned from the source with what they know from the works. Feminist historians see mainly two specific histories. The first is the public, singular history. It is composed of political events and newspapers. The second is made up of women’s history and analyzed primary sources. The integration of these two histories helps historians to look at the past with a more feminist lens, the way feminist historians do. Professor Peter G. Filene of the University of North Carolina recounted in his paper Integrating Women’s History and Regular History that “[his] purpose is to help students understand the values and behavior of people who are unlike themselves. Through history we enter other lives, analyze the forces that shaped those lives, and ultimately understand patterns of culture." In fact, when Filene was asked to teach a course on the history of American women, the revelations of past women allowed him to recognize that he wasn’t learning heroine history, or herstory, but a compensatory history. However, this thought limited his studies. He found himself thinking of women’s contributions to what men had already written down. Rather than having the histories of the ‘public’ and the ‘domestic’ sphere, one should know that this line between the two is imaginary. Though not all women are politicians or war general, boys are raised in the domestic sphere. Not only that, but men come back to it every day in their private homes. Even President Theodore Roosevelt can be quoted to say “[n]o man can be a good citizen who is not a good husband and a good father.” Similar to how history needs domestic history incorporated into it, men’s history cannot be understood without their private experiences known. Women’s history thus needs their private experiences to be combined with their public. To successfully integrate these histories, the world must not have male and female spheres that are synonyms for the private and public. The connections found in public and private men’s and women’s history need to be systematically synthesized to successfully integrate them. So the idea of just two histories creates the challenge that most feminist historians have. A second challenge of feminist historians is integration in digital format. Women’s historians have had some success in working with digital humanists in creating their databases, but the databases are few and far between. This creates a problem for feminist historians trying to create a feminist history database based on women’s history databases. Since data mining is not a field many digital humanist women are involved in, it can be a challenge to find the necessary relationships between these few. Though Filene argues that data mining is the best way to integrate histories, this lack of involvement by feminist digital humanists detaches the work from others sharing similar feminist historian’s work. Digital humanist Bethany Nowviskie pointed out via Twitter that a conference called Digging into Data Challenge had only two women speakers out of its total 33. Sponsored by NEH, NSF, SSHRC, and Jisc, the Digging into Data Challenge’s goal is to address how data mining is affecting research methods by humanities and social sciences. Brett Bobley, of the conference, replied that they had noticed this as well and wanted suggestions on how to encourage women to apply. The instant feedback was overwhelming with a single concept repeated. Ask them by name. Nowviskie made no comment to those loud suggestions. Instead, she prompted twitter with “what do girls dig?” before going on to ask if the digital humanities “itself been gendered?” Finally, she points that “there’s something in the overall rhetoric around data mining worth taking a look at.” With a gendered data mining system in place, feminist historians have little to no hope of integrating their findings with the internet. Their minimal understanding of digital humanities limits their reach to the public audience even as the academic are reached. Feminist historians need to either work more collaboratively with feminist digital humanists involved in data mining or learn how to navigate the digital humanities without adding to the digital humanities’ feminist problems. However both are unlikely to occur as feminist digital humanists are just now themselves being integrated into the digital humanities. An area where feminists have made inroads into the digital humanities world is the creation of online exhibits that highlight the history of feminism. One example is the online exhibit Click! : The Ongoing Feminist Revolution, created by a team working with Clio, Inc.: Visualizing History. This free-access, ad-free online historical exhibit features 46 film clips taken from 27 documentary films, extensive interactive timelines, in-depth essays supported by primary documents, photos, and other resources. Click! The Ongoing Feminist Revolution highlights the collective action and individual achievements of women from the 1940s to the present. In the spirit of 1970s consciousness-raising, the name refers to the “click” moment when women discovered the powerful ideas of contemporary feminism. The name also refers to the computer keystroke that connects women (and men) to the Internet. ↑ "Pedersen, Susan. "The Future of Feminist History"". Retrieved 6 October 2014. ↑ Smith, B. G. (2010). "Women's History: A Retrospective from the United States". Signs: Journal of Women in Culture and Society. 35 (3): 723. doi:10.1086/648517. 1 2 3 Filene, P. G. (1980). "Integrating Women's History and Regular History". The History Teacher. 13 (4): 483. doi:10.2307/494019. JSTOR 494019. ↑ Soja Fiedler (Winter 1993). "And the Walls Come Tumbling Down? A Feminist View from East Berlin". Alternatives: Global, Local, Political. 18 (1): 97–108. JSTOR 40644766. ↑ "Click - The Ongoing Feminist Revolution". www.cliohistory.org. Retrieved 2016-03-09.